"Cookie mix layered in a jar. They are great for gift-giving or bake sales." 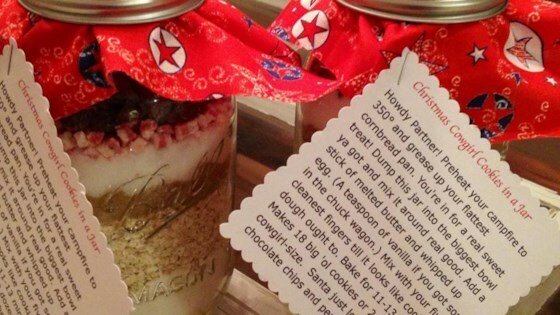 Include a card with the following instructions: Cowboy Cookie Mix in a Jar 1. Preheat oven to 350 degrees F (175 degrees C). Grease cookie sheets. 2. In a medium bowl, mix together 1/2 cup melted butter or margarine, 1 egg, and 1 teaspoon of vanilla. Stir in the entire contents of the jar. You may need to use your hands to finish mixing. Shape into walnut sized balls. Place 2 inches apart on prepared cookie sheets. 3. Bake for 11 to 13 minutes in the preheated oven. Transfer from cookie sheets to cool on wire racks. These were fantastic cookies! However, I think next time I will cut the oatmeal in half. I used quick oats which swell up faster and make the taste fuller than reg. oats.